Leeds United were the better team and deserved the win in Saturday’s Championship clash at Elland Road, according to Sheffield Wednesday boss Steve Bruce. The Owls went into the match knowing it was a must win if they were to keep pace with the play-off chasing pack and dent the Whites’ hopes of gaining an automatic promotion spot. It was a raucous atmosphere inside the Leeds ground as Jack Harrison’s goal was the difference in a dominant performance for Marcelo Bielsa’s men. And Wednesday chief Bruce was quick to credit the Leeds staff for their progress in the last year as they move one step closer to promotion to the top flight. “Well we didn’t do enough but sometimes you have to credit the opposition,” he said. 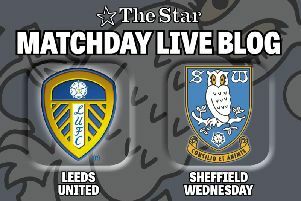 “It was difficult circumstances after the Sheffield United draw, a big huge crowd and to be fair to Leeds I think that’s now the third time I have seen them and they are looking very very good to go up. “The transformation from basically a similar group of players that they had 12 months ago to where they are now is remarkable so you have to take your hat off to them, the manager and the staff. Wednesday were overwhelmed by Leeds’ intensity and had Keiren Westwood to thank as they survived the first half without conceding, but it proved too big an ask for the full 90 minutes. The Owls also suffered a blow as Adam Reach was forced off early in the first 45 minutes through injury, which Bruce confirmed was an achilles complaint that would need assessment and scans to know its severity.